The Offset Pressman: What Is Offset Printing? 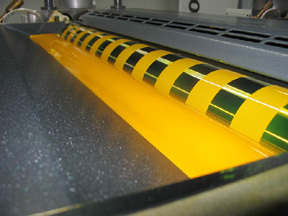 Offset printing is a process used to transfer ink from a plate to a blanket and then to a printed surface. It accounts for 40% of all printed material and is able to reproduce images in very high quantity. 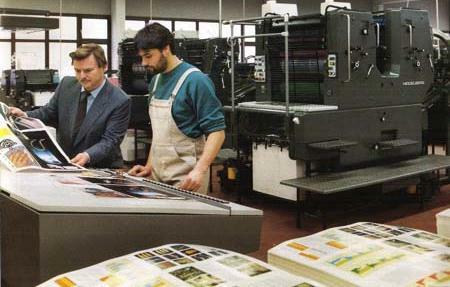 There are many forms of offset printing, but offset lithography is the most common. Offset printing plate loading onto press. The offset printing process itself is quite simple. With offset lithography, an inking system consisting of rollers touches a printing plate. Certain areas of the plate are receptive to ink and so the ink adheres to it. Additionally, by means of a dampening system, water is applied to the plate to bind to areas that attract water. When the water binds to those areas of the plate, it repels the oil based ink from them. Thus some areas attract water while others attract ink. Pressmen work hard to maintain this ink and water balance. The ink then travels to what is called a blanket - a thin rubber layer over a steel cylinder. As the blanket cylinder turns, it comes in contact with the paper. At this point, the paper is squeezed between the blanket cylinder and another steel roller or another blanket cylinder. Offset printing press ink fountain. Modern printing presses can produce full color products at very high speeds using this offset printing process. On heatset web offset presses, the following order usually takes place. 1. Paper is feed from a flying paster, or rollstand. 2. 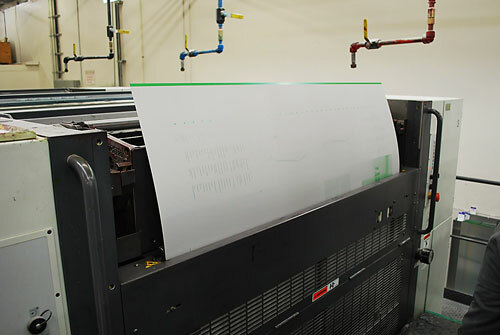 The paper then travels through the printing units where the offset printing process takes place. 3. The printed web of paper then goes through a heatset oven which evaporates the oils from the ink and then cools it afterwards. 4. The product then goes through a folder to make the correct page count for the product. Finally, an inline finishing system will trim and stack the final product. While the initial costs for such an operation are high, the offset printing principle behind it, as you can see, is very simple. Additionally, the cost to produce products with offset printing is quite low in comparison with others. This is the best blog about offset printing I ever see. I have been staying many days here to explore your blog and learn a lot of printing world. Thanks for your dedication to offset printing work. Currently I am studying journalism and media. In one of our classes we are learning about offset printing. Your blog has helped me learn a lot. I need to go visit and see one of these printers for a final project. Would you know of any offset printing in Brainerd, MN ?